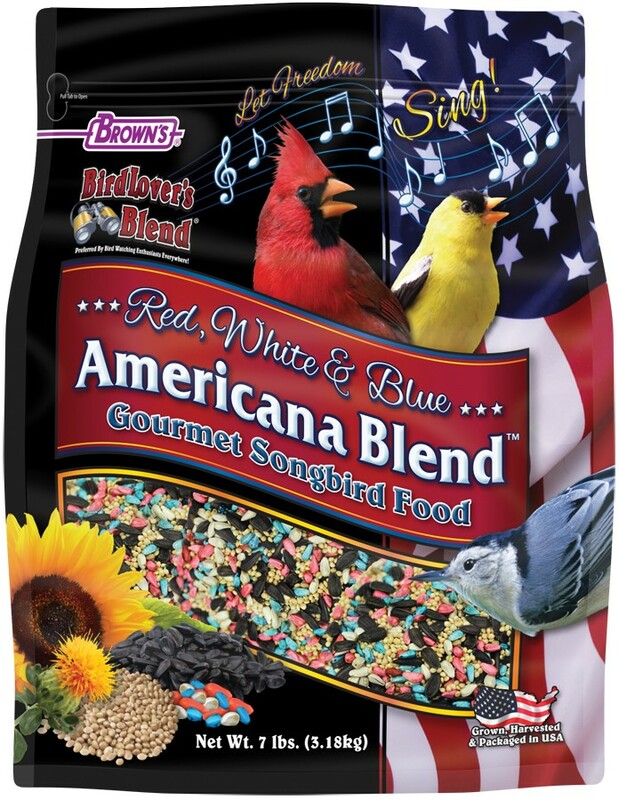 Our Red, White & Blue Americana Blend™ Gourmet Wild Bird Food was formulated specially to show our patriotic colors and support our American wildlife. “Let Freedom Sing” at your feeders by attracting colorful songbirds of all sizes. Bringing Nature to Your Backyard! 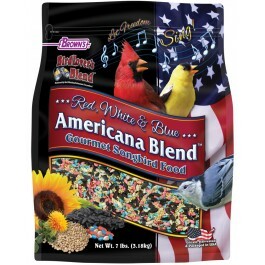 Our Red, White & Blue Americana Blend™ Gourmet Wild Bird Food was formulated specially to show our patriotic colors and support our American wildlife. “Let Freedom Sing” at your feeders by attracting colorful songbirds of all sizes. This colorful and nourishing mix is a filler-free, energy boosting food source packed with their favorite seeds. It’s just what birds crave! Wild Birds Need Your Help! Studies show that wild birds visiting backyard feeding stations consistently have higher survival rates than those without access to feeders. Feeding wild birds year-round with quality foods will help them through the vulnerable times throughout the seasons. Backyard wild bird feeding is a fun and rewarding hobby for the whole family. Birds are entertaining and enjoyable to watch, and feeding wild birds helps build respect for nature while increasing positive human-wildlife interactions. Urban sprawl has consumed much of the land that parks, preserves, and backyard habitats become necessary for wild bird survival. Help wild birds survive by providing sanctuaries and feeding stations in your own backyard. • Wild bird feeding is America’s fastest growing hobby, second only to gardening. It’s so popular that over 55 million Americans feed wild birds! • There are over 2,000 species of wild birds in North America and almost 1,000 of these species are native to The United States! • Spring and summer can be just as stressful for wild birds as the cold winter months. This means wild bird feeding should continue year-round. • Each bird has its own seed preferences and finding their favorites is an exciting part of wild bird feeding. Brown’s® provides a wide variety of wild bird food blends, single ingredients, and specialty products formulated to attract an even wider variety of birds to your backyard. 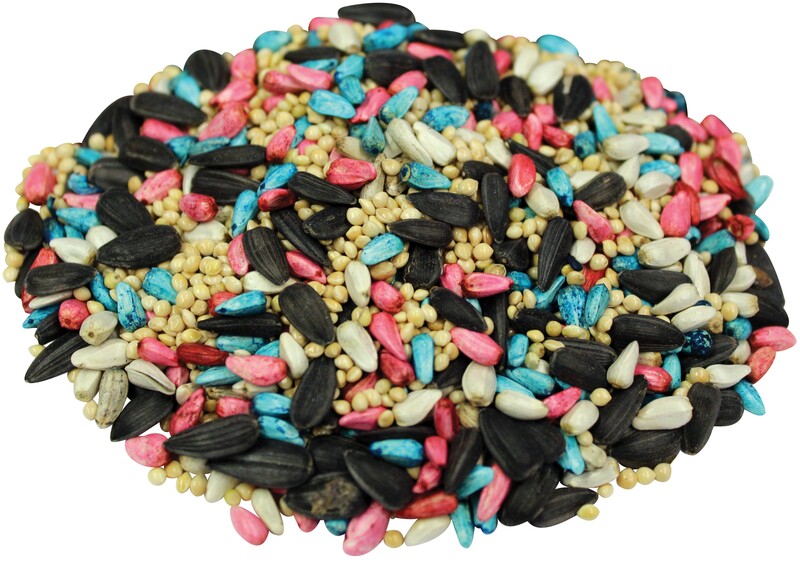 White Proso Millet, Safflower Seeds, Black Oil Sunflower Seeds, Colors Added (Red 40, Blue 1).